It's been a freesing weather in Finland during winter fall 2017-2018. Challenging driving conditions are influencing customers' behaviour. Everchanging trends increase demands in tire retail and aftemarket. Budget products are increasing sales. Customers seek new tire profiles, sizes and brands at competitive price. Are you looking for a distributor in Finland? Promoting new tires, parts and garage equipment? 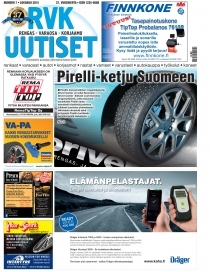 - Contact RVK-UUTISET, B2B aftermarket and tire retail magazine, 39th volume. 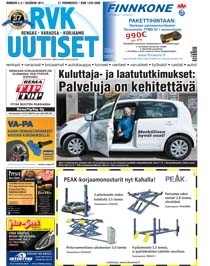 RVK Uutiset has been distributed by subscription and direct mailing to Finnish wholesalers, tire and part retailers, chains and workshops since 1979. The magazine is the number one tire and aftersales media for generations of Finnish retailers. RVK UUTISET is coming out 8 times per year, including two double issues in May and December. Letters "RVK" in the name stay for Finnish words Rengas, Varaosa, Korjaamo meaning Tires, Parts, Workshops. Publishign agenda has been updated accordingly to seasonal shifts and professional demand. 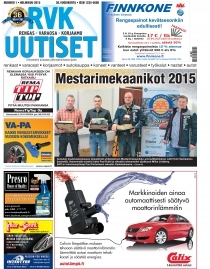 Average edition of RVK-UUTISET in 2017 has been was 3,000 copies per issue. Distribution by direct mailing including tire retailers (app. 800), part retailers and brandships (app. 1.500), garages and workshops (total 5,000), transporting companies (1,200). RVK Uutiset covers various topics and news including domestic and international events, conferences and exhibitions, product news, interviews and business reviews. News are classified as "tires", "parts", "workshops". Tire focusing contents are in February, March and April issues, as well as in September, October, November magazines. For more information and a list of features, please contact Automediat, Valentina Ahlavuo, automediat@automediat.com or cell +358 40 708 6469.